Chinese corn spying: Iowa seeds subject of surreptitious snatching. The FBI cited the Foreign Intelligence Surveillance Act—often used to track suspected terrorists—in its pursuit of Chinese businessmen thought to be engaged in the theft of corn seeds. The surveillance team recorded a bizarre and inept conversation between two of Mo’s associates from DBN Group, Lin Yong and Ye Jian. … As they drive around rural Illinois looking for DuPont Pioneer and Monsanto test fields from which to steal, they begin making a list of the crimes they have committed. After some back and forth, they come up with trespassing for every time they have slipped onto private property, larceny for the seeds and ears they have been stealing from the fields, and multiple violations of intellectual property protections. “These are actually very serious offenses,” Lin says. “They could treat us as spies!” Ye interjects. The context of this seed theft, the piece explains in surprisingly compelling detail, is the United States’ decades-long status as a leader in high-yield corn genetics, which has traditionally been seized on by national security hawks as a means of exerting leverage over powerful but relatively corn-poor rivals like the Soviet Union and now China. 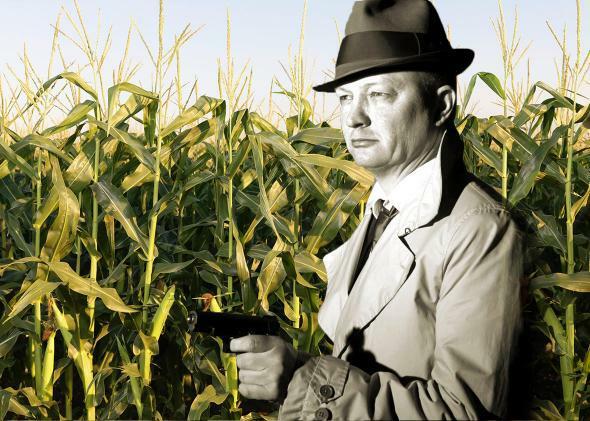 The current Department of Justice considers Chinese corn envy such a threat, in fact, that it used the secret FISA court—which you’re probably more used to hearing about in the context of terrorism investigations—to authorize the deployment of phone taps, email and data storage searches, listening devices, and more against the Chinese businessmen involved in the O’Hare case. It’s really something! You can/should read the whole piece here.